The JCB 406 is a highly productive compact wheel loader with optimal power-to-weight ratio, making it a perfect tool carrier. It’s fitted with a 36.4 kW engine that produces 170 Nm of torque, powering a 2-speed hydrostatic transmission and a load over height of 2991mm. In short, it’s a perfect choice for rental fleets looking for a low cost productive machine with a simple mechanical engine. 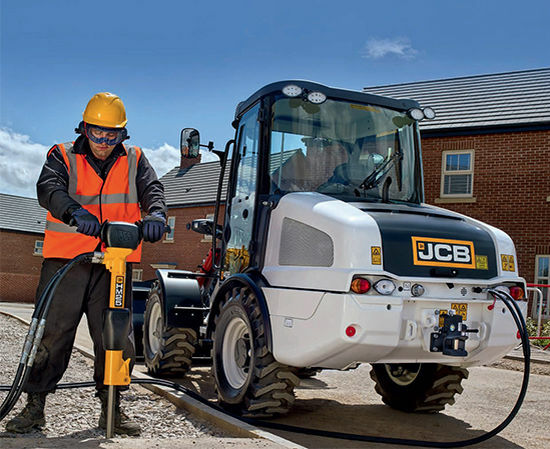 A JCB 406 wheel loader is a highly versatile, productive machine in its standard trim. Our new toolmaster model might just be the one and only machine you need to complete a job. With a rear-mounted hydraulic handheld tool circuit, you can operate a wealth of attachments, including breakers, pumps and disc cutters. There's no need for additional powerpacks or equipment either, which improves fuel consumption. Not only that but one person can drive the loader and operate the attachments themselves, reducing your manpower needs.